November 2018 Reel News is in the mail! ORCA President David Lehmann announces that our 2019 Convention will be held in Tulsa, hosted by Zebco! He also introduces 2 new premium classes of ORCA membership. ORCA Honorary Member Michael Farrior is recognized. Steve Vernon writes about the early Vermont reel making of Brindsmaid. 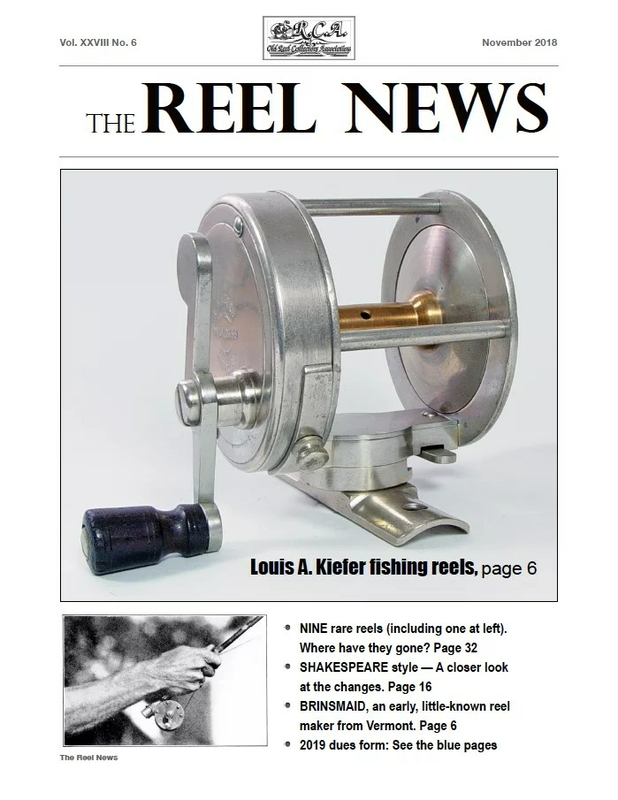 Roger Schultz discusses little known Indiana fishing reel maker Louis A. Kiefer. Betty Barr introduces new ORCA member Vernette Carlson. Dr. Todd Larson introduces Bob Miller’s new book, River Reflections, an ORCA exclusive and he also penned the article entitled Nine Reels and a Really Big Rod.Eric Jeska delves into design details of the earliest Shakespeare reels. Alan Baracco and Linda Kewell present The Kewell Family Dynasty. Plus it is time to renew your ORCA membership and to nominate ORCA members for director positions starting in July 2019. The forms are in the November 2019 Reel News. Join ORCA today and don’t miss out!